Aloha Dream Kitchen™ and Hawaii Gourmet Shopping™ are owned by Lanawiliama, Inc., the U.S. corporation that has been in business since 2001. We concentrate our exclusive inventory around unique and hard to find items that earn good reputations in the consumer market, match strict customer requirements, and serve you faithfully for years. Our pledge is to make every possible effort to keep your shopping smooth and happy. We add a touch of Aloha into each package, putting our heart and soul into every little detail and every box that we lovingly send to a safe journey anticipating a joyful arrival at your door steps. We sell exclusive Hawaii products, unusual gifts, and so much more. Many products we carry have been proudly made in Hawaii! Aloha Recipes for Your Home, Body and Soul: Gourmet Kona coffee, aromatic tea, heavenly chocolate covered macadamia nuts, beautiful Hawaiian calendars and inspirational stationary, exotic Hawaiian perfumes or highly collectible handmade nesting dolls. Give and share some Aloha! Aloha Dream Kitchen® Online Store. Your trusted source for quality Royal Kona, Lion Coffee, Hualalai Estate Coffee, Mulvadi, Royal Hawaiian Perfumes, Wicked Wahine, Forever Florals, Island Bath & Body, Terra Nova, Island Heritage, La Pavoni, Honeywell, Vic Firth, Fork Chops, Mountain Woods products and other brands. All items are brand new and accompanied by U.S. warranties from respective manufacturers. Being a small company means more warmth, personalized attention and direct communication with you. We strive to offer you the best and are able to customize your orders and meet your needs in most cases. Our goal is simple - if we are not thrilled with a product's performance ourselves, we would not offer it to you in our store. We may search for specific gourmet or perfume products and get them special ordered per your request, particularly in Hawaii. Our web address is Hawaii-gourmet-shopping.com. Devoted to gourmet online shoppers searching for finest, unique merchandise. We chose this term meaning not only our wonderfully loyal gourmand customers who continue returning for our top of the line gourmet products, but also all of you who love and know how to shop putting a lot of thought into selecting exquisite shopping spots, just as we put a lot of effort into picking and describing our extraordinary products. Find quality gifts from magnificent Hawaiian Islands and beyond while experiencing first hand warmth of our service and personalized attention to detail. To join our exclusive V.I.P. club for gifts with purchase and special club pricing, place two or more orders with us and subscribe to our newsletter. Save up to 70% on shipping by purchasing more than one product in the same order. Some restrictions may apply. On a smart phone, you may be unable to view ingredients, brand stories, testimonials and any notes listed below the product description. Please click on View Full Site at the bottom of your mobile device to see everything as a desktop view but return to a mobile site for an easy browsing and a mobile checkout. Get a Virtual Tour of Hawaii and Bring Something Home from Us! Hawaii Gourmet Shopping is the one-stop online store for treats produced and grown in Hawaii that can usually only be found in Hawaii. Hawaii Gourmet Shopping – Bringing a little bit of Hawaii home to you. A new Hawaii online gift store, HawaiiGourmetShopping.com has been launched to add beauty, pleasure and adventure to people. Recently, this site has proudly announced that it offers more Hawaii Gourmet treats, lovely perfumes, and incredible island gifts.This Hawaiian online shop guarantees that there will be more amazing surprises to anticipate in the long run. There are many different online stores that offer the same products and services. However, only HawaiiGourmetShopping.com provides free gift wrapping in Hawaiian themed gift bags for small items. These are great for gift-giving and special occassion gifts for a loved one. Hawaii Gourmet Shopping offers a wide variety of products that are well-organized according to distinct categories. Some of these categories include Hawaii Cookies, KONA Coffee, Hawaii Gifts, Hawaii Jewelry, Hawaii Figurines, Hawaii Treats, Perfumes of HI, Calendars of Hawaii and the very popular Merrie Monarch Hula DVDs. Customers can also enjoy up to 70 percent savings on shipping when they purchase more than one item in the same order. This online shop has been developed with the main purpose of providing unique and popular merchandise that travelers have taken home from their visit to Hawaii and want to continue to enjoy even though Hawaii is now thousands of miles away. Hawaii Gourment Shopping brings Hawaii home to you. Online shoppers at Hawaii Gourmet Shopping should consider signing up for the store’s newsletter to recieve specials and discounts available to store newsletter subscribers only. In addition, there are regular promos and great discounts to take advantage by first time visitors. The company behind the success of http://www.HawaiiGourmetShopping.com is Lanawiliama, Inc. which is a corporation based in the United States since 2001. Lanawiliama was started by a Hawaii based husband and wife team who felt visistors to Hawaii needed a way to continue to recieve the blessings of Hawaii brought home in their suitcase. Lanawiliama inventories only the most popular and unique items that have a good reputation for quality in the local Hawaii market. Most products have been exclusively produced, grown and created in Hawaii. 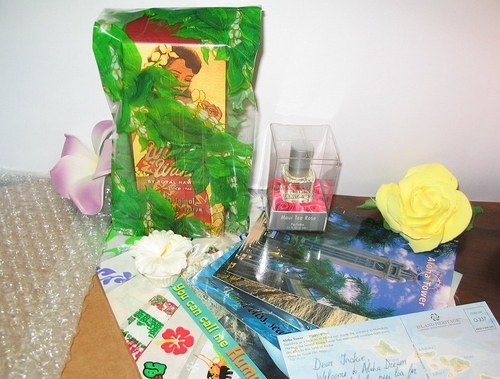 [...]"
Photo: Aloha Process in Action - what it takes to create your package with lots of love and attention: Wicked Wahine Original Perfume, Hibiscus Lip Balm by Royal Hawaiian, Maui Tea Rose Rollerball by Island Bath and Body (see option selection), postcards and packing supplies. Flowers are not included. The rose is handmade from Deco clay by Svitlana. Svitlana C. Photography. Marketing and copywriting by WaveHawaii Productions. Photographers: Svitlana C. and Willy C.
Aloha Dream Kitchen logo design by Neonic and LC.